Love, love, love Nasturtiums....Kapuzinerkresse :). Their beautiful bright flowers and green hued leaves are not only a treasure for the eyes, they are YUMMY. I planted a ton of different varieties, and now they are becoming aboundant. Once in bloom, the blossoms wilt fairly quickly. So what's a witchy girl to do? Eat them! 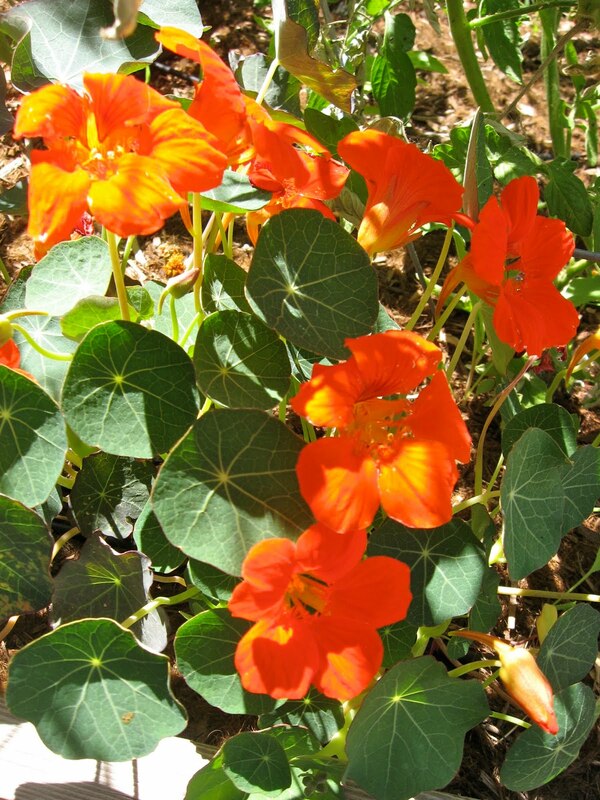 I have been putting the blossoms in our salads or as a pretty garnish forever, but now I am going to try some of the recipes from my books, or you can google "Nasturtium Recipes". 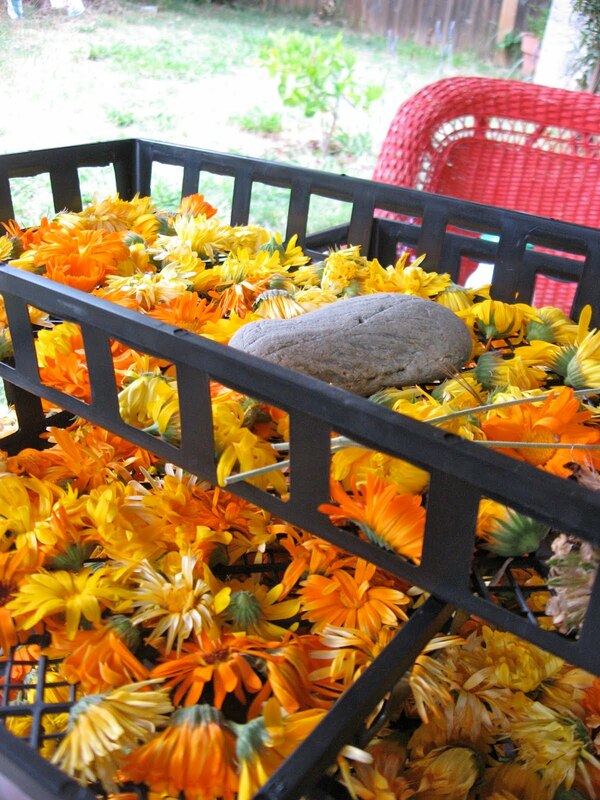 Pick petals, wash, and check for critters. Dry. Chop petals and leaves. Mash garlic, if you use it. I have very strong chives in my yard, so I use those instead. Chop flowers into butter (think Cold Stone Creamery). I put in a little lavender, since I have it, and I love it :). Put in jar (I used a 1 pint jar), sprinkle with lavender, put in fridge. 1 stick of butter fits nicely in a jar if you don't pack it down. I like it "fluffy", so the flowers don't get smashed. If you pack it in, you can probably do 1.5 sticks, just add more flowers accordingly. 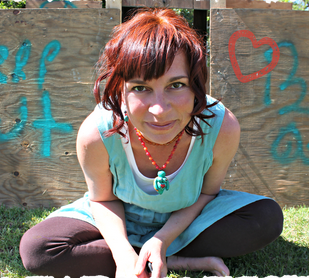 I was recently introduced to home-made Ginger Ale by Ayla at ChrysalisWoman. Not only did it taste yummy, I was intrigued at the process of making it. Now, I am not usually one to jump on the opportunity of "feeding", "turning", "culturing", "watering", anything on a daily or consistant basis....it scares me. We took a little of our Ginger Bug and started a new one. Now the process won't take so long, and we will continously brew. What a great alternative to soda! If you google "Ginger Bug", or "Ginger Soda", you will come up with a plethora of brewing tips & recipes! I ordered some water kefir grains (the growing of beneficial bacteria...mmm....).The water kefir...yum. The initial batch came dehydrated, so it takes a few days to get started. After that, you can continuously reuse your grains. We added some lemon and had a tingly lemonade. I did start the newest batch with sucanat, which is dried cane sugar, instead of organic sugar. The sucanat has a molasses flavor, and is supposed to help the grains multiply. Waiting to see what the difference will be in taste. I also tried my hands at joghurt to try to replicate the joghurt I love so much from Germany. Sofar, I have killed both batches. It is a bit fickle, as it needs warmth to start to culture. The first time I left it too close to the oven when baking bread (instant curdle), and the second time the house got to warm. We don't use the AC unless it is close to 100, so I will have to find a way to do this now that the days are getting hotter. Great place to explore and order cultures is culturesforhealth.com. My sweet blooded little Goddess came back from camp COVERED in bites...even though I succumbed to letting her use the super duper chemical bug spray this time. Last year, she got off the bus and said: "Mama, your natural bug spray did NOT work on these bugs!". Anywhooooo...she is back, and now I am here to stop the insistant itch. This recipe is taken from Rosemary Gladstar's Family Herbal (one of my favorite "go to" books). Can also be used on scratches, so it is good for the scratched open bites too. 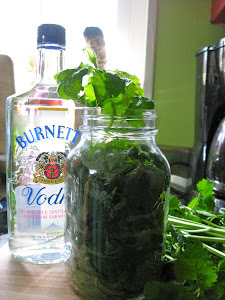 Mix in a glass jar. 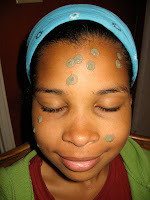 Take a little out and mix with water into a paste (I used aloe vera gel instead of the aloe powder) and apply to bites, or wounds. You can add some lavender or tea tree oil, I did not because my princess does not like the smell :). I will cover the left over paste with some Seran wrap and a rubber band, store it in the fridge. This way, I can easily reapply during the day, and it will be cool :). If it dries, just remoisten with gel or water. Now I have a few varieties in my backyard, they are planted to and fro. The first ones to bloom are the Red Empress. In their honor, I made a salad with them tonight :). Enjoy! Slice cucumbers in fine slices. Sprinkle generously with salt and set aside to "pull" water. Once you see a good amount of water drawn from the cucs, drain. Dollup with a few BIG wooden spoonfuls of sour cream :). Stir. You will notice a nice frothy sauce forming. Season with mustard, pepper, and dill. 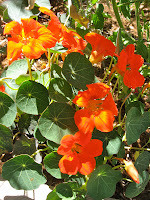 Put on plates and garnish with Nasturtiums (which have a slightly peppery taste). My son goes outside every day to see what is ripening. He counts the figs. If anything is BARELY ripe, he feels the need to be the first to taste it. This is our first almost ripe Boysenberry. Now, we only have green ones :). I planted this bush in the fall. It is supposed to be thornless, unfortunately it is developing some nasty big thorns :(. I just wrote the company who grew it a letter today. I was not wanting a rambling, thorny, berry bush in my jungle. I am graced with an abundance of some herbs, in particular Rosemary, Lemonbalm, Mint (both pepper and spearmint), Borage.....and recently, Mugwort. 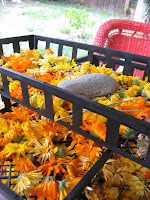 Though I enjoy just looking at them or brushing up against them when I am out and about in the yard, I have been experimenting with different methods of drying and preserving this fabulous bounty. 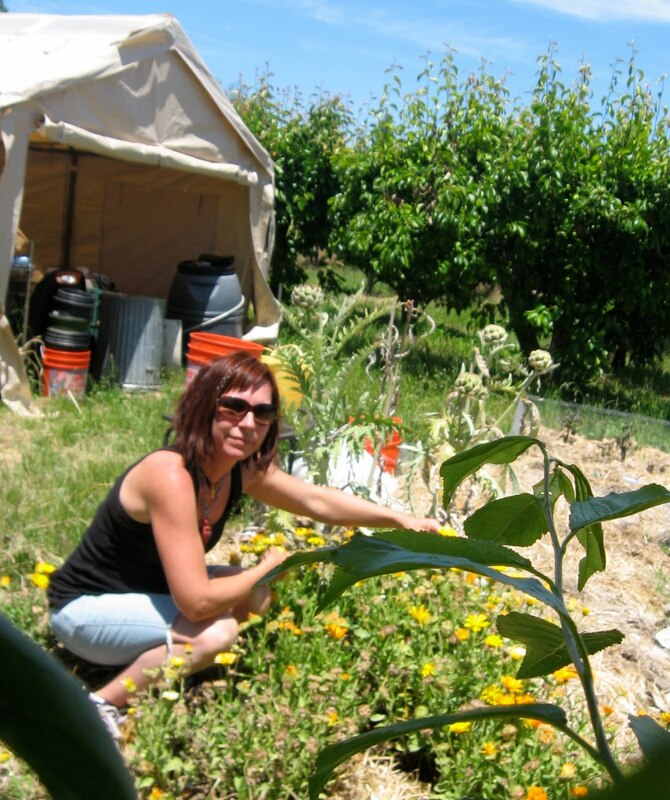 This picture is not me in my yard :), but me at my friend Julie's demo garden (see more below). Please share if you have had success drying or preserving (tincturing?) that are not mentioned. Lemonbalm: The best thing so far for me: hanging upside down to dry. It does not take very long, and I have learned to take down the sprigs as soon as the leaves are crispy to preserve the lemony freshness we love. It is a bit tedious to remove the dry leaves from the sprigs without them crumbling to nothingness (I like LB big, like Texas...), but am getting the hang of it after my third harvest. Oregano: Hang. Dries easily, and I just zip it right into a container by stripping the branch. Rosemary: Hanging. Strip right into the container. I use the stripped branches for my Kitchen Witches :). 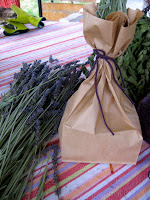 Lavender: Cut fronds and tie upside down in a paper bag. As Lavender dries, just shake the bag. The little lavender buds will shake down :). I also have a ton of mint. I am not sure that I want to dry it, but will try mint jelly and mint pesto start with. Will report back when I do. The same with the Borage. The little white flowers taste like cucumbers :), other than that, we have only used the new leaves in "Gruenne Sosse". 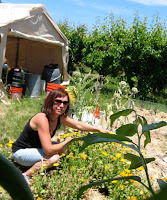 I had 4-5 foot high stalks of borage, covered with flowers. I left them as long as possible, since the bees were having a heyday with them. Today, I pulled them out. The Borage is a bit of a bully, spreading and seeding as it pleases :). Between it, and Ms. Lemonbalm, well they were crowding my whole herb bed. Not to mention that have spread their little children way outside of the box, they are homesteading all over the backyard. Normally, I let this wild rumpus go, I enjoy it. In this case, I had to be a leader and pull out the Borage, and a bunch of Lemonbalm so my Echinacea could finally get some breathing room and grow! As I was pulling, I discovered many new little Borage & Lemonbalm babies....they multiply like rabbits. The Borage was too far gone to use, but I just hung the second harvest of Lemonbalm to dry, as well as more Oregano. Just in time to take down the first round and store. I love how my kitchen smells when I hang them in there to dry. Like a summer in Italia.